At Kruckman Family Dentistry, Dr. Jalissa Kruckman understands that there is more to a pretty smile than just good teeth. A beautiful smile requires facial structures that not only support it but enhance it as well. Dr. Kruckman is one-of-a-kind in her knowledge and understanding of how the many facial structures work. She is uniquely qualified to provide the dental and facial treatments you need to obtain the smile of your dreams, not to mention a younger, more appealing and comfortable smile, right here in our Waconia dental clinic. What exactly is BOTOX® and XEOMIN®? Botox and Xoemin are both injectable neuromodulators, meaning they temporarily alter the nerve impulses of targeted muscles, therefore reducing or eliminating contraction-induced wrinkles. BOTOX® and Xeomin are the most popular, nonsurgical, cosmetic treatment used in the United States today to support beautiful smiles. Not only can Botox or Xeomin help support your smile, it has also been proven to offer therapeutic treatments for gummy smiles, teeth clenching and more advanced symptoms of TMJ (Temporomandibular Joint) disorders. BOTOX and Xeomin are an FDA approved treatment that has proven itself to be a safe and effective option for dental care plans. On their own, they can produce a softer, smoother, and younger appearance, and in combination with other dental procedures, it can promote a healthier and more attractive smile. BOTOX and Xeomin injections are made up of safe, purified proteins that aid in relaxing facial muscles, correcting wrinkles/fine lines, and preventing new wrinkles from forming. They also help to reduce the activity of the muscles in the face that traditionally cause wrinkles, such as frown lines, crow’s feet, and forehead creases. The purified proteins work in this way by temporarily blocking the signals to the muscles from the nerves. This blockage reduces the muscle movement which, in turn, causes the wrinkles to relax and soften. 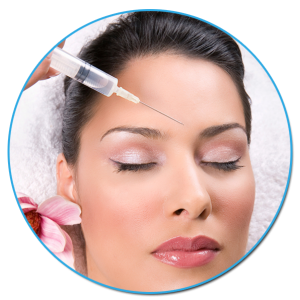 BOTOX and Xeomin are a quick acting solution and typically results in visible improvements within three to five days. Results commonly lasts three to six months and may be used alone or in conjunction with other dermal treatments. When applied correctly BOTOX or Xeomin may also be used to help lift areas of the face and extend the life of other dermal filler applications. If you are looking for results that last just a little bit longer or provide more dramatic enhancement, please read about our dermal filler options below. 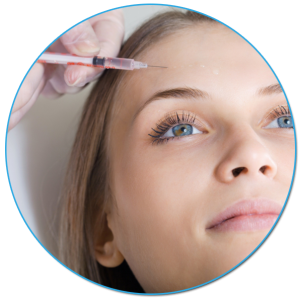 Dermal filler injections are made up of a gel-like substance that when injected, replaces the natural substances in the facial skin that are lost due to aging. Dermal fillers are typically injected into the areas around the mouth and nose, as these sections of the face tend to show the greatest signs of aging. The fillers, once injected, work to reverse common signs of aging by reducing and eliminating wrinkles/ fine lines, lifting the corners of the mouth, and replacing soft-tissue for an increased appearance of volume. At Kruckman Family Dentistry we offer JUVÉDERM® as our dermal filler of choice. JUVÉDERM may be safely injected in conjunction with Botox, as they target different areas of the face, for the ultimate facial enhancement. Why Choose a Dentist for Botox, Xeomin or Dermal Fillers? Dentists are smile makeover experts. They have extensive training and knowledge of the oral-facial areas. They have comprehensive knowledge of the facial muscles and expression dynamics. Dentists are highly experienced in providing injections and anesthetics for comfortable treatments. They are trained and accredited to augment the face using these techniques. Dr. Kruckman, specifically, has been trained by the International Academy of Facial Aesthetics (IAFA). Count on her, and the rest of the Kruckman Family Dentistry team, to provide you with the injections and results that our patients in Carver, Waconia, and Victoria desire! Contact us to schedule your first Botox, Xeomin or JUVÉDERM appointment today.